We’ve written about Joy of Socks before as a great online sock site for buying fun, crazy, and cool socks. As the holidays come around, we thought an annual reminder about the available socks on Joy of Socks would be important! What holidays should you wear some of the wacky and fun Joy of Sock patterned socks for? October is Halloween Sock month. Joy of Socks has several spooky designs to keep your feet scary this Halloween — including “Witch on a Broom” socks for Women, and “Halloween Batnado” socks for Men. November is Thanksgiving Sock month. On the Joy of Socks website, you can find some trendy and patriot Thanksgiving socks including “Pilgrim Bear Socks” for women and “Turkey Party Fowl Socks” for men. And December is Christmas Sock month. Men’s designs include “Gingerbread Break a Leg” socks and for women there are “Christmas in July” Socks. If you plan on having a boring holiday season, we definitely don’t recommend you buy socks from Joy of Socks. 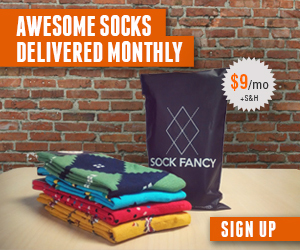 But if you are looking for some fun and cool footwear, there is no better site than Joy of Socks!